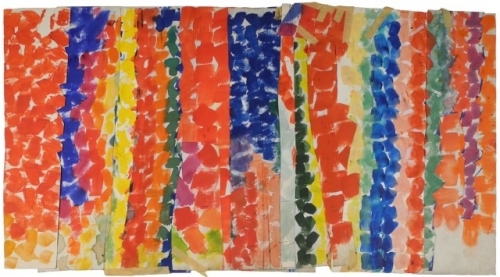 Standout Piece: Alma Thomas’ "Untitled." (There are several works by this non-title in “Alma Thomas: Thirteen Studies for Painting”; this is the one numbered AWT-108 in the catalog.) From a distance, the work appears to be nothing more than a sequence of paint splotches, varied in hue, in only a couple of discrete widths, arranged into haphazard columns across the paper: It’s Gene Davis meets Clyfford Still distilled into overgrown patches of color, like Seurat stipples on an American (read: McDonalds) diet. Study Guide: Upon closer look, the preparatory study reveals a meticulous working process. Leaves of paper have been cut apart and stacked; their edges jag and dog-leg. The artist never made an attempt to hide the fact that the work is a study. As with many of the pieces in the exhibition, Thomas stapled and taped the strips of paper into position before touching up the splotches so they could jump the seams. Seeing these works means seeing how another person toils through the process of realizing an idea, reminding the viewer that there’s nothing precious in the process: It’s okay to rip things up and reassemble later.